16 June 2014. Agios Pharmaceuticals Inc. in Cambridge, Massachusetts says the U.S. Food and Drug Administration designated its therapy for acute myelogenous leukemia an orphan drug, qualifying it for tax incentives and other benefits. The orphan drug status comes at the same time of new findings reported from an early clinical trial of the drug, code-named AG-221. 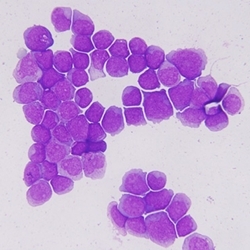 Acute myelogenous leukemia is a cancer of bone marrow and blood, where abnormal white blood cells called myeloblasts build up in the bone marrow and crowd out healthy white blood cells. The condition can also occur with red blood cells and platelets. The disease spreads quickly if not treated and can result in infections, anemia, and bleeding disorders. The company says less than 10 percent of patients in the U.S. are eligible for bone marrow transplant treatments for the disease, and its five-year survival rate is 20 to 25 percent. Agios is a biotechnology company that develops therapies aiming to break up the metabolic processes helping cancer cells grow and spread, by inhibiting key enzymes feeding cancer cell processes. The company says this approach disrupts the proliferation of tumor cells without harming healthy cells, which can happen with current cancer therapies such as chemotherapy. Agios was founded by three cancer researchers — Craig Thompson of Memorial Sloan-Kettering Cancer Center, Lewis Cantly of Weill Cornell Medical College and New York-Presbyterian Hospital, and Tak Mak of University of Toronto and the Campbell Family Institute for Breast Cancer Research — who serve as scientific advisors to the company. AG-221 is an inhibitor of a mutation affecting activity of the isocitrate dehydrogenase-2 or IDH2 gene, where proteins expressed from the mutated gene cause a reaction promoting abnormal growth in mitochondria, the part of cells that provides energy. Agios is testing AG-221 in an early-stage clinical trial as a treatment for advanced blood-related cancers, including acute myelogenous leukemia. The trial is testing the drug’s safety at various dosage levels among 35 patients with advanced blood-related cancers, as well as the drug’s potential clinical benefits. Agios reported interim results from the trial on Saturday at a meeting of the European Hematology Association in Milan. The findings show 14 patients responded in some way to the drug, with progression of the disease stabilizing in 5 patients, and another 6 patients achieving complete remission that continued for 4 months. The company says AG-221 was well tolerated, with most reactions ranging from mild to moderate, and no adverse events causing a discontinuation of the drug. Orphan drugs treat underserved patient populations, defined as those affecting fewer than 200,000 people in the U.S. Agios says 35,000 to 40,000 have acute myelogenous leukemia, of which about 15 percent carry the IDH2 mutation. Orphan drug status provides tax credits for clinical trials and exemptions from FDA fees. The biopharmaceutical company Celgene licensed AG-221 in April 2010, giving Celgene the option to gain exclusive worldwide rights to the drug, which Celgene exercised on Friday. Under the deal, Agios is responsible for early clinical and regulatory work, while Celgene will take AG-221 through later clinical and commercialization stages. Agios is eligible for up to $120 million in milestone payments and additional royalties on sales.